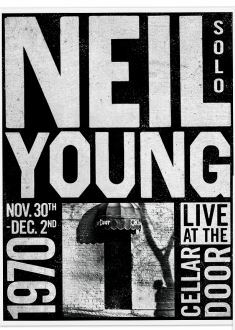 After 43 years in a vault, Neil Young is releasing an album of performances recorded during a run of a dozen shows in Washington D.C., from November-December 1970. Entitled Neil Young Live at the Cellar Door, this time capsule offers intimate listening of a young Young and the young Martin D-45 he had been playing for less than a year. The 13-song collection is available for pre-sale at the artist’s official website in high-quality digital FLAC, as a CD, or on 180 gram vinyl. Performing two sets a night, Young used the week-long booking in the small club to hone material for his upcoming concert at Carnegie Hall, which became a mainstay bootleg record ever after. Live at the Cellar Door will provide state of the art audio mastering unavailable back in the day. Including well-known Buffalo Springfield tunes along with fresh releases from the then new smash LP After the Gold Rush, the ever-changing artist also debuts new material at the dawn of his post-CSNY solo career. Young and vital, Young was a vital force in the post-Woodstock era and this record provides a glimpse of an emerging superstar on the verge of going supernova. Premium bundle includes a lithograph advertising the venue.